The author s compilation of a unique Register identifying those individual South Wales miners who served in the Tunnelling Companies has allowed a remarkable story to be told. For the first time, the lives of individual South Wales miners are highlighted from pre-war mining days, their very personal contribution within the Tunnelling Companies, to the resting places of those who did not survive the war and, for the survivors, their ultimate despatch home. The underlying theme is of an indefatigable band of men, together with like-minded miners from other British Coalfields, asked to carry out multi-tasked duties associated with a form of military mining not foreseen prior to the outbreak of war. Before a major battle, these men constructed large underground dugouts to house troops away from enemy shell fire. In exploding huge mines under German lines immediately before the British attack they aided the advancing infantry in causing death and confusion in the German lines. During the British advance in 1918 they became experts in the dangerous work of defusing enemy booby traps, delay action and land mines in front of the advancing troops. They showed all the resolution, fortitude, determination, if not sheer bloody-mindedness, to see the job through, so reminiscent of the miner at home struggling to earn a decent rate of pay in the most arduous of conditions. There was a price to pay. Details are given of the two hundred and seven miners who died whilst on active service and of how many others were repatriated after gunshot wounds, gas poisoning or ill-health. Accounts are given of miners entombed underground as a result of enemy explosions, medals awarded for acts of bravery when attempting to free trapped miners and of those taken prisoners-of-war when the enemy broke into British workings. Old men and young boys lied about their ages to gain acceptance into the Tunnelling Companies and suffered the harsh consequences. 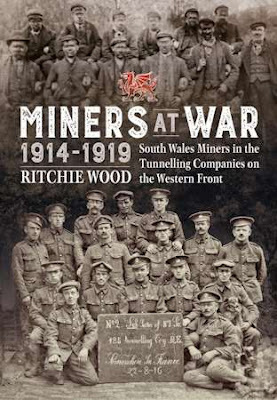 A unique investigation such as this not only acknowledges the miners personal contribution as tunnellers but also serves as a scholarly and novel addition to the existing literature concerning the history of the Great War, its Tunnelling Companies, South Wales, its coalfield and the lives of its miners. There can be little doubt that this work will in years to come establish itself as a standard text in the history of military mining not only in a specific sense but also as a work on the Great War in general. Contains many b/w photos, tables, maps, diagrams.